A couple weeks ago we took a look at a case from Thermaltake's Armor Series, the A90 (our full review can be found here). 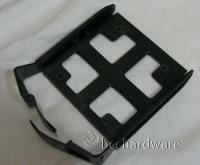 Today we are going to take a look at another case in this same Armor series, the A60. The A60 from Thermaltake features a couple new features like USB 3.0 support and a new "SideClick EasySwap" Hard drive bay that is accessible from the side of the case without having to remove the side panel. We will take a closer look at these two new features in the next section of the review. 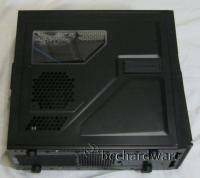 The A60 and A90 model of Thermaltake cases have a somewhat similar look to them, both are black cases with a fair amount of meshing with a blue LED lighting scheme and both of these cases also feature a small window on the side. While the overall shape of the two cases are a bit similar both cases have some unique features which set these cases apart. 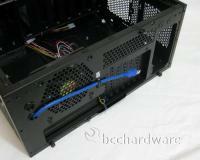 Let's take a closer look at the Thermaltake A60 Mid-Tower case. 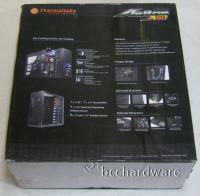 The A60 is a mid-tower case which is in Thermaltake's Armor series of cases. 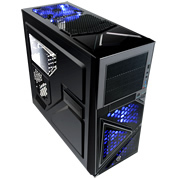 This case is in the sub $100 dollar range which will appeal to enthusiast who are on a budget and don't want to spend huge money on their case but still want a good amount of features. There isn't anything too out of the ordinary once we get the side of the case off. 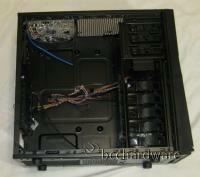 The A60 comes with 3 fans and has room for 4 more if you want some more airflow. The fans in the top (200mm) and the front (120mm) both are blue LED fans, the fan on the rear of the case (120mm) is a standard non-LED fan. The power supply in the A60 is bottom mounted and as you can see in the picture below (right) it also features a mesh shield to keep unwanted debris from getting into your power supply accidentally (mesh is removable for easy cleaning). 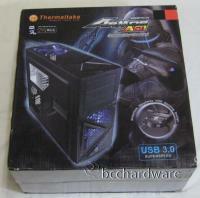 As I mentioned earlier, the Thermaltake A60 case is USB 3.0 compatible. In the picture below (right) you can see how they accomplish this (blue cable). The USB 3.0 cable on the front of the case is attached to this blue cable that is hanging out the back of the case which then plugs into the rear of the motherboard and gives you front access to USB 3.0. This seems a little bit "ghetto" but it gets the job done and will save you from reaching to the rear of your PC when you want to quickly access your USB 3.0 ports. 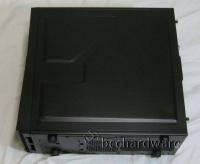 All 6 hard drive bays come with "tool-less" adapters and are side-mounted for easy access. You will need to screw your hard drives into the "tool-less" adapters but once they are in you can easily add or remove drives. As you can see in the picture below (right) the top drive stick out a bit, and in the next set of pictures you'll see why.